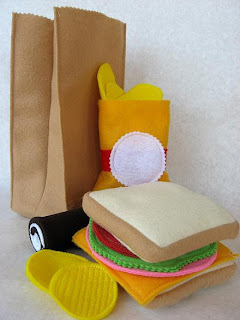 If you like handmade toys or if you like to sew, then you should check out this Felt Brown Bag Lunch tutorial over at Skip to My Lou. You can buy the templates for $1.75 or install the Skip to My Lou button in your sidebar and Cindy will email them to you for free. Cindy is also giving away the felt to make these lunch kits, so drop on by and leave a comment.